This chat has now passed, but you can see the archive HERE! 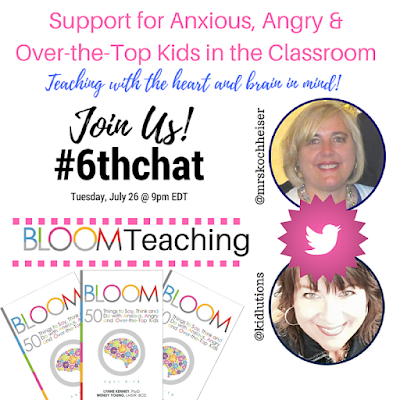 Teachers want to know the best ways to support anxious, angry and over-the-top kids in the classroom and we'll be discussing it on the next #6thchat, this coming Tuesday, July 26, 2016 at 9pm EDT. We'll be covering some of the toughest behavioral/attitude issues teachers face and share how the BLOOM approach can make all the difference! 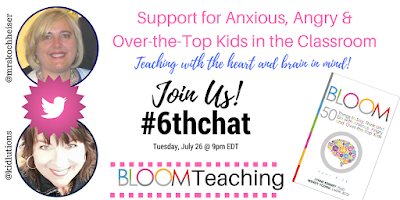 Just follow the #6thchat hashtag! Just follow along with the #6thchat hashtag and join in the fun! We'll be giving away a BLOOM book to one attendee from the continental U.S.
@mrskochheiser will be hosting/moderating! I've known her for well over 30 years, and this is the first event we're doing together. We were kind of "neighbors" a VERY long time ago! Are we sisters? Cousins? Or something else? If you'd like to learn how we're connected, ask on the chat! I'm sure we'll let the cat out of the bag on the chat!